Babir is currently Weldricks Teacher Practitioner at the University of Bradford, Pre-registration Lead for Sheffield, Rotherham and Barnsley RPS Local Practice Forum, as well as being on the RPS Pre-Registration Advisory Group and OTC lead for the RPS Pre-registration team. He Currently practices in Weldricks Pharmacy, Scunthorpe. I am currently Weldricks Teacher Practitioner at the University of Bradford, Pre-registration Lead for Sheffield, Rotherham and Barnsley RPS Local Practice Forum, as well as being on the RPS Pre-Registration Advisory Group and OTC lead for the RPS Pre-registration team. I began my pharmacy journey in 2003, at the University of Bradford, after completing a Biomedical Sciences degree previously. I then embarked on a Postgraduate Diploma in Community Pharmacy at Keele University in 2009. I have also completed my RPS Faculty journey and am at Stage 1. I undertook a 10 week secondment as a Clinical Commissioning Group Pharmacist early in 2016 and am also a Dementia Friend Champion generating over 300 Dementia Friends. I currently practice in Weldricks Pharmacy, Scunthorpe. In June 2016, my pharmacy was awarded the Chemist and Druggist Medicines Optimisation Award for our innovative LPS Intervention Service. I’m no hero. I think it’s important to raise awareness of the amazing charity and to help generate as many funds as possible to support the fantastic work that Pharmacist Support do. What hero fundraising activities did you do have planned? What’s the one thing that pharmacy people love? Pens! 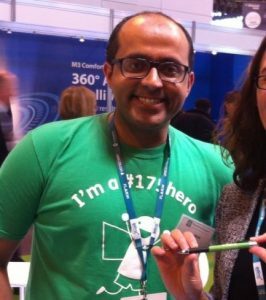 I’m quite active on social media and enjoy interacting with the whole pharmacy team and have also written two light-hearted books about pharmacy. I’m too lazy to run unless I’m running after someone who hasn’t paid for their prescription. I decided to sell limited edition Pharmacist Support/Mr Dispenser pens for the charity. This proved strangely popular! The charity is important to me because they help my peers in times of need. I also see them at most pharmacy events. Many of the phone calls that they receive are from pre-registration students who are close to my heart.